In November 2017, McLean was selected by Tradepoint Atlantic to remove 3 inoperative ore unloading cranes located in Sparrows Point, Maryland. Each of the steel cranes was 150’ tall with 130’ booms, so the logistics of getting these massive structures safely disassembled presented a unique challenge, but one McLean was well equipped to handle. 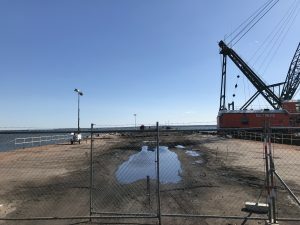 The Baltimore and the Hampton Roads, two of McLean’s whirleys, which are barge mounted cranes that can rotate 360 degrees picking up and depositing their loads, were used at Sparrows Point. 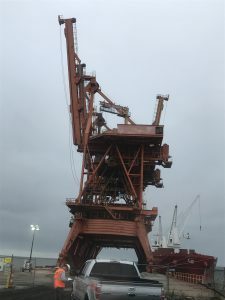 A team of a dozen McLean employees proceeded to cut the ore cranes into pieces, and the McLean cranes securely lowered the pieces to the ground where they were loaded onto barges and trucks for removal from the site. Three of the sections to be removed weighed 300,000 pounds each, and were removed with a dual crane lift by the Baltimore and another McLean whirley, the Jamestown. The rigs were towed, while still holding the section, to a local marine yard for processing. For most of the project, team members worked from 80 or 150 foot man-lifts in order to access parts of the ore cranes that needed to be cut into small sections. In March of 2018, after spending over 10,000 man hours removing 7.25 million pounds of material that was either recycled or submerged to create artificial reefs, the project was completed. The McLean team faced many challenges along the way, but worked cohesively to overcome them, and finished the job with no serious injuries or lost time accidents.